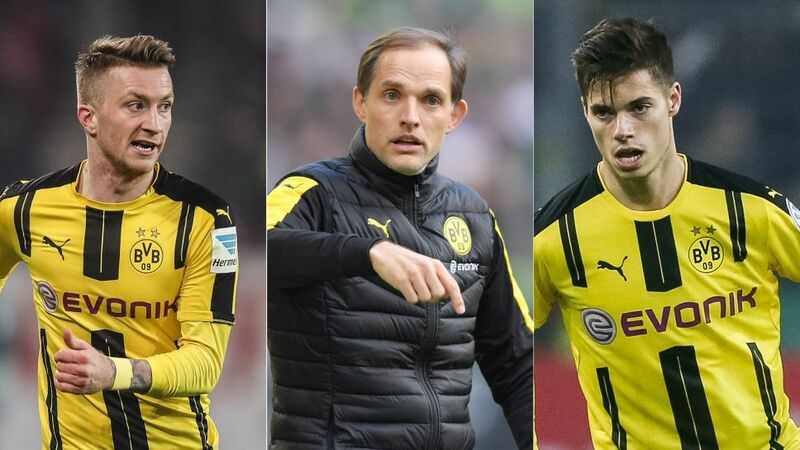 Marco Reus' (l.) and Julian Weigl's (r.) returns could prove key for Thomas Tuchel (.c) and Borussia Dortmund against Bayern Munich. Borussia Dortmund renew their Klassiker rivalry with Bayern Munich in the semi-finals of the DFB Cup on Wednesday evening. For Dortmund, a fourth consecutive cup final appearance is up for grabs, but so too is a chance for revenge, with the Bavarians running out 4-1 winners when the sides met in the league earlier this month. Click here for live build-up to this week's DFB Cup semi-finals! Last season, in Pep Guardiola's final campaign as Bayern coach, Arjen Robben and Franck Ribery were largely reduced to spectator status with Douglas Costa and Kingsley Coman preferred on the flanks. Carlo Ancelotti has had other ideas since his summer appointment, though, and Robbery, despite having a combined age of 67 - compared to CoCo's 46 - have once again stolen the show. Ribery put in a game-high 39 sprints and 84 intensive runs the last time the teams met, despite making way for Costa after 74 minutes. Incredibly for a nominal left-winger, he also put in just a single cross from a wide area, preferring to cut inside of BVB right-back Felix Passlack and pull the strings from a central role. Robben, meanwhile, started on the right flank, and was the chief recipient of the Frenchman's delivery. The Dutch half of the duo - who clocked a world record 37km/h in full flight at the 2014 World Cup - found acres of space between Marcel Schmelzer and Marc Bartra - and scored a trademark cut-inside-curler to boot. Passlack had a stunning game against an overlapping Ribery in the Supercup last August, and was unlucky to find himself on the wrong side of a 2-0 defeat. When Ribery changed tack at the Allianz Arena recently, though, the 18-year-old had no answer. Lukas Piszczek has enjoyed arguably his best season in a Schwarzgelb shirt, and got the better of Ribery when Dortmund beat Bayern 1-0 on Matchday 11. The 31-year-old Pole may not have Passlack's turn of pace, but his reading of the game and ability to play off either foot could be key. Personnel changed, Tuchel could also tweak his formation. Bartra is a Barcelona-schooled, ball-playing centre-back, but getting into wide areas to close down danger is not his strong suit. BVB captain Schmelzer spent their most recent match-up camped in no man's land, insecure about leaving space in behind him but starting too high up the pitch to do anything about it, once exploited. Expect to see a return to a flat back four. With Julian Weigl injured for the recent 4-1 loss, Gonzalo Castro operated as the lone defensive shield until Mikel Merino was introduced with 20 minutes left to play, and could only watch on as Thiago Alcantara, Xabi Alonso and Arturo Vidal dominated possession. Bayern's three amigos made the ball their friend, ending the clash with a combined 349 touches and 279 passes completed. Castro, with his supposed midfield partner Raphael Guerreiro playing closer to penalty-box predator Pierre-Emerick Aubameyang than himself, could only muster 30 touches and 24 passes. The 21-year-old returning to the side is one half of the equation. The other is making sure he comes in beside Castro, and not instead of. Weigl might be better at threading a pass through the eye of a needle than Castro - something the latter had to attempt with his teammates so dispersed - but even he would rather have company in the middle. Castro's forte is box-to-box bustling, and the pair will need to be at their best to throw a spanner into the works of Bayern's distribution machine. Aubameyang has plundered a Bundesliga-high 27 goals this term - one of which proved to be the winner in the first Bundesliga showdown between the sides in November, but in the reverse fixture earlier this month the Gabon captain found himself isolated, with Ousmane Dembele and Christian Pulisic - in stark contrast to Ribery and Robben - hugging the touchlines. Aubameyang's 25 sprints weren't matched by accurate deliveries, and he had only two shots on Bayern's goal to show for his efforts. Wide men need space, but not space from each other. With Weigl and Reus once again available and an expected return to 4-2-3-1, Dortmund's cup clash with Bayern has all the makings of a classic. Bayern will have other ideas, of course, but if Tuchel learns the lessons from their most recent encounter, we should be in for a show-stopper. Head right this way for the Dortmund-Bayern DFB Cup semi-final LIVE blog!